Summer is the time for fresh fruits, and peaches are one of my favorites! I still need to get around to making a fresh peach pie…but for now we will sink our straws into these delicious and refreshing Fresh Peach Margaritas. 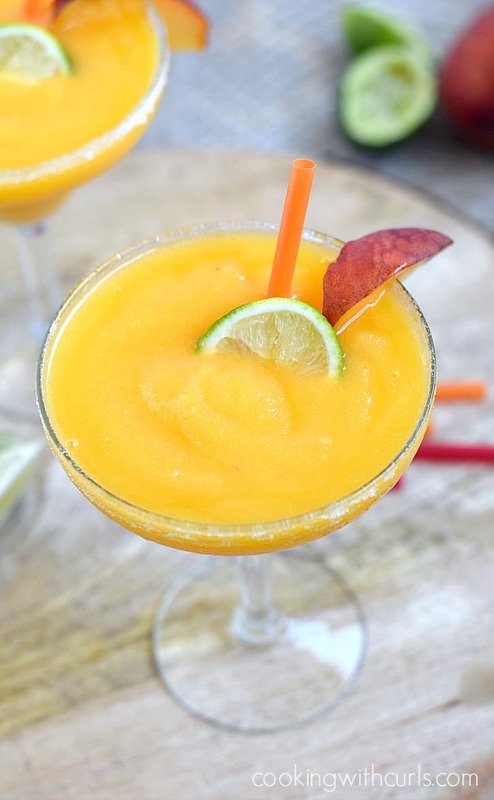 I cheat and make mine with frozen peaches because I like nice, thick margaritas, but fresh peaches would definitely work as well…..
By using frozen peaches, I don’t need to add ice…and ice waters down your cocktail…so there’s that as well. 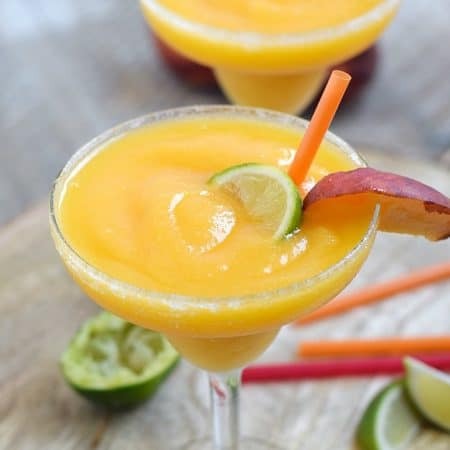 😉 Either way you make them, they will be a refreshing way to cool down on a hot summer night…and these Frozen Peach Margaritas are super simple to make as well. 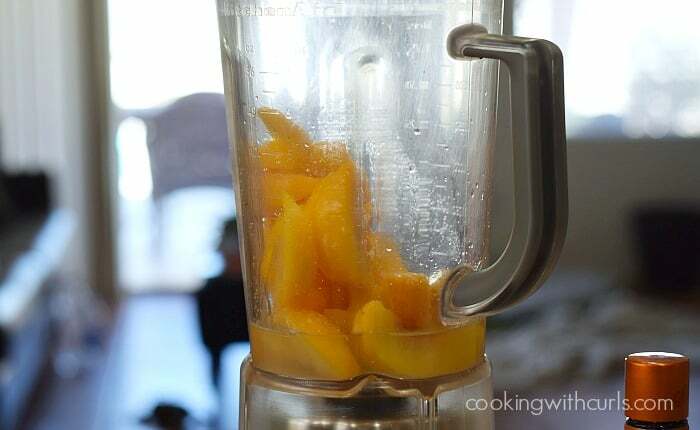 Place all ingredients into a blender…..
Start with the lowest setting, and continue until smooth and completely combined. Rub lime juice along the edge of the margarita glasses and dip into sugar to garnish…..
You can use colored sugar, fine sugar, sugar with large crystals, whatever you have in the pantry is just fine. Just remember to eat something first….like chips and Queso Blanco Dip. Wouldn’t it be fun if everyday was Cinco de Mayo? 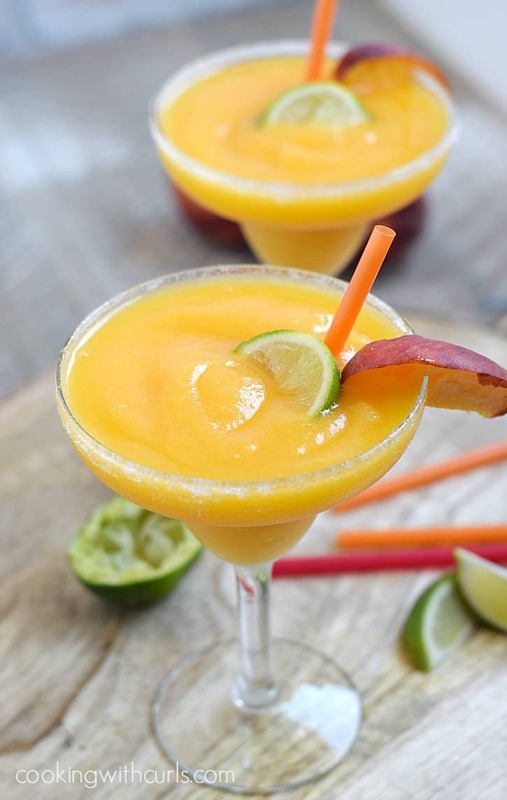 Hot summer nights call for for a refreshing drink, and these Frozen Peach Margaritas are perfect way to cool down! Rub lime juice along the edge of the margarita glasses and dip into sugar to garnish. Use more or less sugar depending on the sweetness of your peaches. This looks refreshing, frozen fruit in cocktail all the way! Pinning. This margarita is right up my alley! I have been enjoying a lot of peach lemonade this summer. I will definitely have to give this margarita a try. I live near a peach orchard, so I will by local peaches and try freezing them myself for these drinks! Visiting from the Weekend Potluck! Ooh, this looks delightful! I can’t wait to try it. Now I know what I’m going to do with some of the frozen peaches in the freezer – thanks for the recipe! What an awesome blog. I would like for you to come join us on Share the Love blog party every Monday thru Wednesday. We would love to have you.